This GIFT GUIDE is probably my most favorite that I’ve done yet! Y’all know I love my wine. So it seemed only fitting to compile a list of the best gifts to gift the wine lover in your life! There’s something for every kind of wine drinker. Whether they drink on occasion or are a self proclaimed wine connoisseur. Cheers to finding the perfect gift! Oster Cordless Electric Wine Opener - Under $20! Every wine lovers dream gift. Who wouldn’t want easy access to the wine bottle?! Swoon Wine Decanter - This is the perfect gift for the sophisticated wine drinker. And would be a great addition to anyone’s Bar Cart. Monogram Marble Wine Stopper - A gorgeous and personalized wine accessory. A great gift on it’s own or can be paired with a bottle of wine. Stainless Steel Stemless Wine Tumbler - Under $15! This 12oz. stainless steel wine tumbler is insulated and has an anti slip grip. Perfect for outdoor events, camping, beach vacay or laying out by the pool. Also comes in other colors. Perfect for the casual wine drinker…. Winc Wine Club Membership - The gift that keeps on giving. This monthly membership is curated by the wine lover and includes 4 bottles shipped straight to your doorstep. SippingTHIS Wine Coasters - These wine-themed coasters would make a great gift for anyone. Definitely a conversation starter for Holiday Parties. Also makes for a great stocking stuffer. *Comes in a 4-pack or 8-pack Holiday Mixed Set* Use promo code: RAE15 for 15% OFF $50 or more. Rabbit 4 Piece Wine Tool Kit - Under $25! A wine lover’s necessity. This set includes a corkscrew, a foil cutter, a drip-stop ring and a wine/champagne sealer. Hope this Gift Guide helps give you ideas for all the Wine lovers in your life! Cheers! **GIVEAWAY ALERT 12/4** Head over to my Instagram account @reinventingraenyc for how to enter + more details. My second Gift Guide this Holiday season is a round up of gift ideas for HER. The ladies in your life whether it be your Sister, Bestie or Girlfriends you Brunch with on weekends. There is something for all the Gals in your life. Winesulator w/ 2 Wine Tumblers- For the Wine Lover. And the perfect excuse to have a wine night at your besties house. Available in other colors. Urban Decay Naked Cherry Palette- This gorgeous palette includes matte and metallic shades that any beauty lover will gush over. Block Letter Monogram Necklace- If you’re looking for something a bit more personalized, this necklace is perfect! Mother Hood Life Lightweight Sweatshirt- For the friend who is also a MOM. She will love this comfy sweatshirt that she can wear on those busy Mom days. Rose Quartz Face Roller- The newest beauty obsession makes for a great gift for the skincare lover. LUSH Hygge Holiday Gift Set- What’s better than giving the gift of relaxation?! This bath & body set is ideal for anyone. Drybar Full Size Favorites Holiday Gift Set- For the gal who always gets blowouts at the salon. This set will help her maintain her mane from home. I hope you find this gift guide helpful when shopping for your best Gals! Comment and let me know who you’ll be shopping for. Now that Thanksgiving has come and gone. Holiday Season is in full swing. And you know what that means...lots of invites to Holiday Parties. 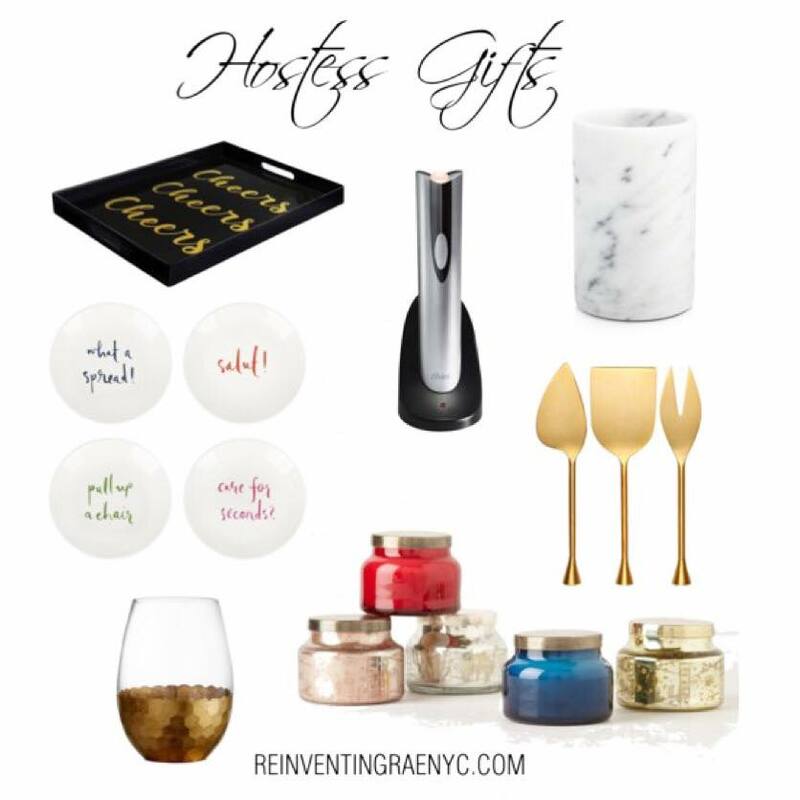 And you don't want to show up empty handed, so I'm sharing some hostess gift ideas (most under $25). Gift giving is the best and these gifts are sure to impress. **Note: I've linked the lowest prices for each item with today's CYBER MONDAY Sales. ** Happy Shopping! This tray is multifunctional and makes the perfect home accessory for any hostess. Especially for the hostess who loves to entertain. Can't you just picture this tray full of festive cocktails being passed around the party?! Wine accessories are always appreciated. I have yet to have purchases an electric wine opener for myself. So I would be more than happy to receive this as a gift. Less time opening bottles means more time drinking. For the person who seems to own everything. This marble wine chiller is the perfect gift. It's not only pretty but functional. And also doubles as a utensil holder, making it two gifts in one. These plates are SO CUTE and colorful. And with fun sayings detailed, they are bound to be a conversation piece. This gold cheese tool set is the perfect addition to any charcuterie board. And you can never have enough serving pieces. Drinking WINE is more fun when you have pretty glasses to drink out of. For the hostess who is a wine lover, these are sure to impress. And with a set of 6, all the ladies will be drinking pretty at the party. Candles are always a great gift idea. And these Capri Candles have been filling my Instagram feed lately. Not only do these candles smell AMAZING but they come in a gorgeous iridescent jar. Yes, Please! We are just a few days away from Valentine's day and if you haven't hinted yet to the man in your life on what you really want. Well, here is a list of items you can share with him. And if you're a SINGLE gal, like me. Why not treat yourself to a gift along with that bag of chocolate and bottle of wine you plan to consume on Valentine's Day. No judgement here. Treat her to an experience of having her make-up done by a professional. Rouge NY is a great Beauty Bar here in New York City. There’s also at home options, like Glam Squad that offer hair & makeup services. Not only will your girlfriend appreciate this amazing gift. But she will look extra fancy for you on your date. Every girl deserves some pampering from time to time. A spa day is the ultimate gift. And if you send her along with her best friend, well you are bound to be rewarded. As a woman, we really appreciate when a guy gives us a gift that has a personal touch to it. Pouring your heart out to her in words on a card or writing a poem, will be sure to make her feel loved. Nothing says “I love you” more than a romantic getaway. And she will swoon over the fact that you planned it all by yourself. Think of places she has always wanted to travel to or places that are meaningful to you both. I know it sounds clichè. The secret is getting her a bouquet of her favorite flowers. And if you have them delivered to her office with a sweet note attached, it will make her day! Cupcakes would make any girl happy. And you can pick out her favorite flavors (chocolate or double chocolate). Butter Lane Bakery here in the city, even offers classes where you can decorate your own cupcakes and take them home at the end of the night. Hint: Date Night! Cook her dinner and pick up a few of her favorite bottles of wine or new wines to try together. You can create your own wine tasting right from your living room. And if she really loves wine, you could get her a monthly wine subscription. What girl wouldn't love wine just showing up on her doorstep every month?! If you really want to win her heart over. Create a gift she will love for years to come. A framed photo of the both of you, a playlist of love songs or a personalized gift with her name or significant date inscribed. Good Luck ladies! I hope you get some amazing gifts this Valentine's Day! And feel free to share this post with your significant other to drop hints.